Whether you hold your wedding ceremony and reception of just your wedding reception at the Adolphus Hotel in Dallas, you are in for a treat. This wedding photo shows the Grand Ballroom floral and decor arrangements by Jackson Durham moments before the doors open and the guests come in for dinner. 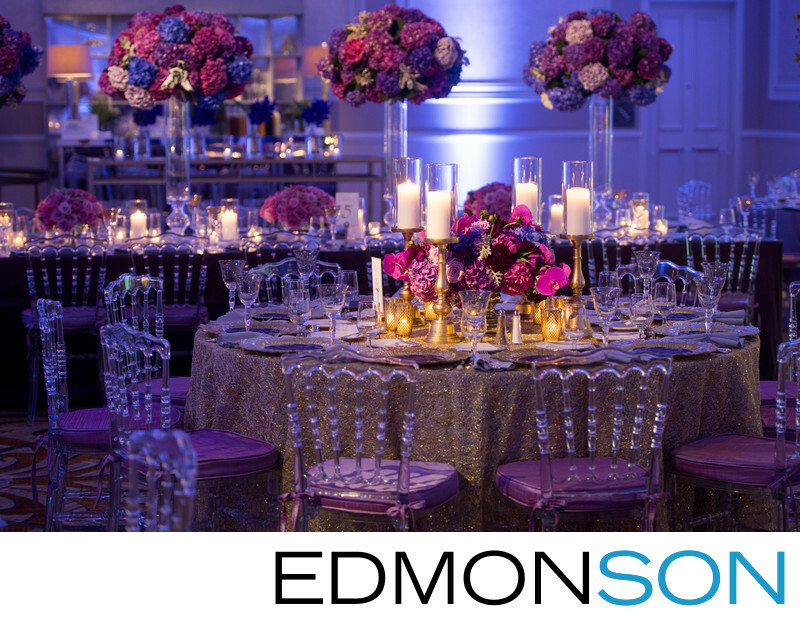 The Adolphus Hotel is one of the leading wedding venues in Dallas - Ft. Worth providing two different ballrooms to choose from along with the French Room. It features Beaux-Arts design on the exterior and a rich history going back to 1912. The Grand Ballroom showcases Italian crystal chandeliers and gorgeous ceiling paintings to transform your experience. Featuring 24,000 square feet of ballrooms and salon in a French Renaissance style, the Adolphus is sure to provide the perfect backdrop for your upcoming wedding or event. The other popular ballroom is known as the Century Room featuring a mirrored wall backdrop. The French Room is a AAA Five Diamond award winning resteraunt sure to please the most discerning of palettes. They offer event planning services as well as catering, full-service concierge and hotel rooms for your out-of-town guests. Other great ideas include hosting your bridal shower party, post-wedding brunch, or rehearsal dinner. The Adolphus is located at 1321 Commerce St, Dallas, TX 75202 and can be reached at (214) 742-8200. 1/40; f/4.5; ISO 1250; 85.0 mm.